Skipper Angelo Mathews has the utmost faith in fast bowler Lasith Malinga to deliver on the big stage. With two days to go before the Sri Lanka team embarks to Dubai for the Asia Cup fifty-over cricket tournament doubts still lingered on the fitness of batsman Dinesh Chandimal and off-spinner Akila Dananjaya. Sri Lanka are due to leave on Tuesday but captain Angelo Mathews was left with the task of knowing whether two of his key players will be with him or not probably by today. Dananjaya is delaying his departure to be beside his wife who is expecting their first child while Chandimal is fighting to get fit after sustaining a hairline fracture on the middle finger of his right hand during the recently concluded domestic T20 league. “Akila is not certain for the first two matches and Chandi is working with the physios and doctors and a final confirmation of his availability will be known today or tomorrow,” said Mathews. The format of the tournament is such that Sri Lanka or any of the other five participating teams – Bangladesh, Afghanistan, Pakistan, India and Hong Kong will need to win their first round matches to have a chance of qualifying for the second stage. Failure to do so would mean an early exit from the tournament. In that context Dananjaya who has bowled Sri Lanka to victory in the recent ODI series against South Africa plays an integral part. His absence for Sri Lanka’s first two games against Bangladesh on September 15 at Dubai and Afghanistan on September 17 at Abu Dhabi will be greatly felt. Veteran off-spinner Dilruwan Perera more renowned for his bowling in the Test circuit has been included in the 16 to take Dananjaya’s place. Mathews is confident that his team has the potential and the skill to win against any side. “Even though we have not won a series for quite some time the way we finished the South African series was a confidence booster,” said Mathews. Sri Lanka lost the first three ODIs to South Africa but bounced back to win the next two and the one-off T20I to regain their morale in one-day cricket where they have not fared well at all in the past one and a half years or so. “There’s no guarantee that we can win the Asia Cup but if we play to our potential we have the skills and the players to win against any side provided we do well in all three departments,” said Mathews. “This is a tight tournament where the margin of error has to be very minimal or you could find yourself out of the tournament after the first round. The team that marginalizes its mistakes to a minimum will win,” he said. A lot of focus on the Sri Lanka team and in the tournament will be on the return of legendary one-day fast bowler Lasith Malinga to international cricket after a year in the wilderness. 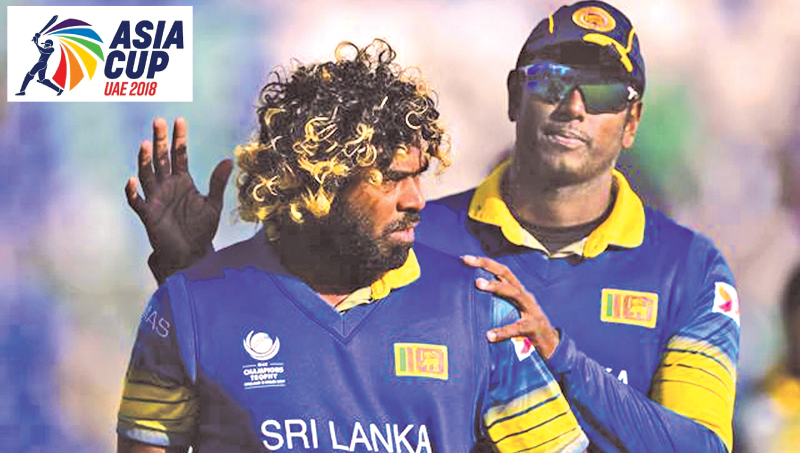 Malinga’s had his ups and downs in a chequered career and at 35 finds himself with a chance to bowl himself back into contention for the 2019 World Cup with a stellar performance in the Asia Cup. “I back Malinga to the core. He can deliver on a big stage although he hasn’t played one-day cricket for some time. We picked him after only playing in a T20 tournament because he has the skills. I have the fullest confidence in him,” said Mathews. “My opinion is that this is a big tournament. All the players have been asked to play in domestic tournaments to be eligible for selection that is the selection policy. Although Malinga did not take many wickets we should not judge his performance purely on that. We need to look at what situation he bowled, and how he bowled. He bowled extremely well and he was very economical. He bowled his yorkers at the death. More than the wickets we also have to look at other factors as well,” he said.